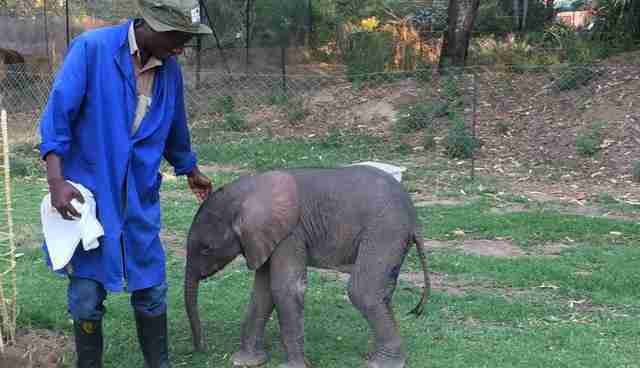 A 3-day-old orphaned elephant calf - so vulnerable his umbilicus has not yet been sealed - has been rescued after being found nearly unconscious in Zimbabwe. 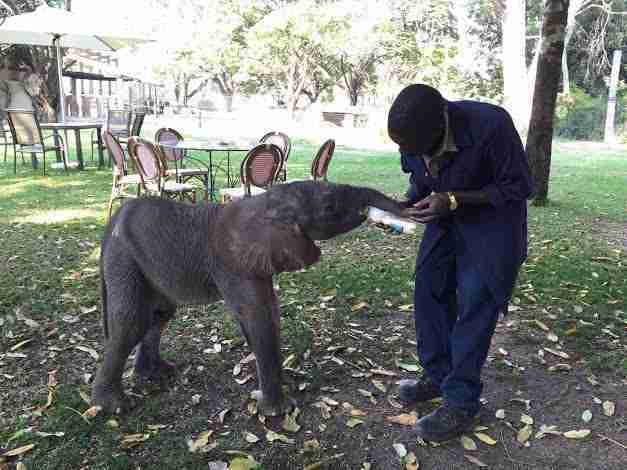 The tiny newborn, now under 24-hour surveillance at a local elephant nursery, is the youngest calf the Zimbabwe Elephant Nursery (ZEN) has ever rescued. They named the newborn Zuwa, which means "Sun" or "Light" in Shona [native language to Shona people in Zimbabwe]. ZEN says the youngster is exceedingly fragile, and with the help of veterinarians from Aware Trust, the group has already had to pull the little one "back from the brink" Friday morning. 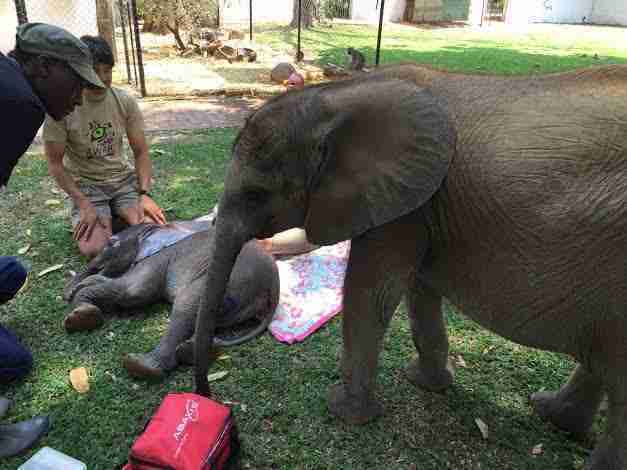 The baby was found in the Save Valley conservancy area of Zimbabwe by local parks rangers, says Jos Danckwerts, who works at ZEN along with his mother and ZEN founder, Roxy Danckwerts. "When we arrived [to rescue him], he was very hot and weak," Jos Danckwerts told The Dodo. He retrieved Zuma on October 14. "His legs were a bit wobbly but he could still walk," says Danckwerts. "He was quite vocal when we got him standing. His hydration was ok as the team who found him managed to get some fluids into him with a bottle, which was very fortunate." Roxy Danckwerts told The Dodo that, unlike many cases of orphaned elephants, she does not think the baby's mother was poached: "We think that due to the soaring temps and lack of water in that area, she and the calf gave up." He was found alone and reportedly unconscious, she says, "in a dry pan that was 25 km from water." "We know that we have a huge challenge on our hands, but will fight hard for this little man's life," she adds. Zimbabwe is currently experiencing a drought, explains Jos, "though it is too early to tell the extremity of it. However, it is almost every year now that the seasons are unusual, so it's more correct to say we are seeing and feeling the severe effects of climate change here." ZEN currently has five other elephants in its care. 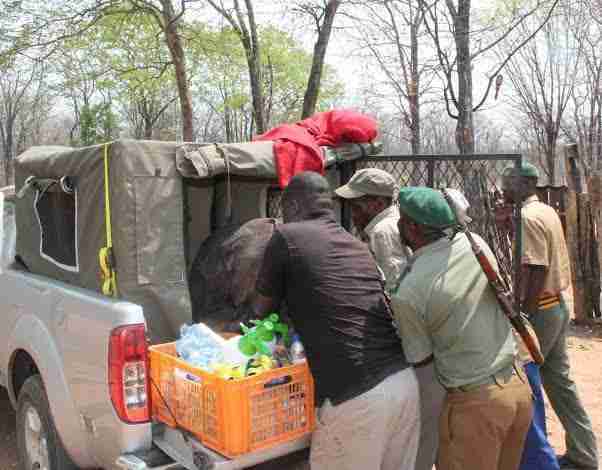 The elephants, says Jos, were very aware of Zuwa's arrival. "We believe they were calling to him using infrasound in the night," he adds, "as Zuwa was evidently agitated and looking and sensing in that direction." 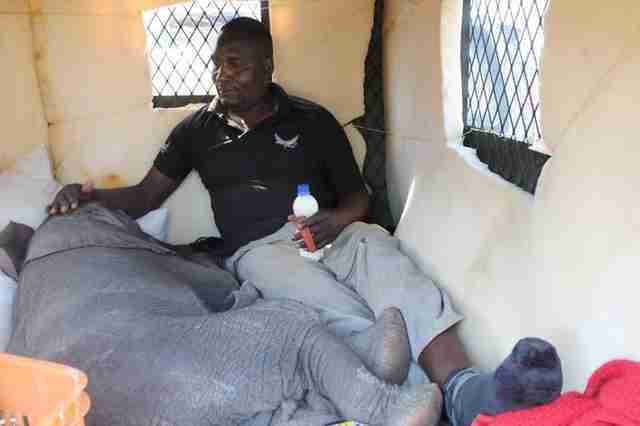 All the elephants, he adds, eventually faced the intensive care room, where Zuwa is being tended to round-the-clock by the ZEN team. The immediate goal is to encourage the baby to drink the nursery milk formula, so he receives energy and nutrients vital for his survival. One of Zuwa's caretakers is Benson Mudede. When asked what he thinks is the biggest challenge in caring for these vulnerable orphans - beyond their feeding - Mudede replied: "[These elephants] are like my children. I fear I do not know enough how to save them, and that makes my heart very sore." 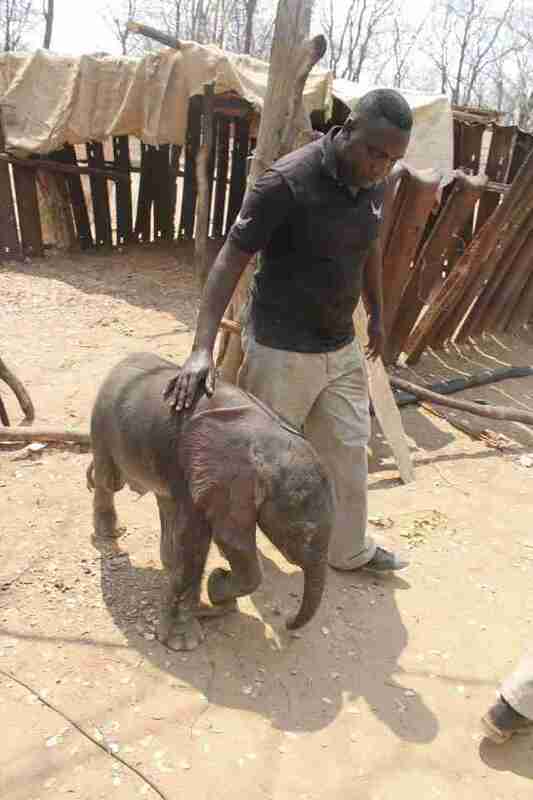 To quickly donate to the care of Zuwa at ZEN, please go here.